White Rock Minerals (ASX: WRM) advised on Wednesday that it had commenced drilling at the Mt Carrington gold-silver project in northern New South Wales, an initiative that will assist the company in establishing a Definitive Feasibility Study (DFS). Since 2010, WRM has made good progress at Mt Carrington having successfully expanded the mineral resource. The JORC 2004 Indicated and Inferred Mineral Resource currently stands at 338,000 ounces of gold and 23 million ounces of silver. The DFS will allow the company to upgrade the resource to JORC 2012 standards and provide the foundations for the metallurgical test work required to lock down the preferred plant design. There are four gold dominant deposits (Strauss, Kylo, Guy Bell and Red Rock), one gold-silver deposit (Lady Hampden) and three silver dominant deposits (White Rock, Silver King and White Rock North). All of these deposits are amenable to open pit mining with mineralisation extending from surface, providing WRM with the potential to both substantially expand the mineral resource and transition to a sizeable producer within a relatively short period of time. 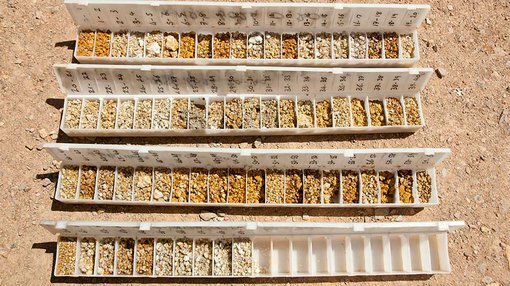 Scoping studies currently support the development of a gold-silver operation at Mt Carrington. Based on Australian dollar commodity prices of $1600 per ounce gold and $22 per ounce silver, projections point to production of 111,000 ounces of gold and 6.7 million ounces of silver over an initial mine life of seven years. However these are projections only and investors should seek professional financial advice and further information if considering this stock for your portfolio. It is worth bearing in mind that based on current commodity prices and foreign exchange rates the Australian dollar gold price is circa $1700 per ounce and the silver price is $24.20 per ounce. While WRM has several options open to it in terms of prioritising mining initiatives, a planned drill program which will provide further material for metallurgical testing is being sourced from the open pit Lady Hampden deposit. WRM Chief Executive Matt Gill said that the Lady Hampden open pit forms an important part of the mine plan in the DFS including the probable optimum ore processing route. The deposit currently has a JORC 2004 indicated and inferred resource estimate of 4.3 million tonnes grading 58 grams per tonne silver and 0.5 grams per tonne gold for 8.1 million ounces of silver and 64,000 ounces of gold.